On a Spanish island of The Canaries, Alena Ehrenbold is calmly floating on her surfboard, her eyes on the horizon. She is patiently waiting for her first real wave of the day. Alena is a professional Swiss surfer, and it is not by accident that she is currently ranked number one in her country. Regardless of her skills, she is at the bottom of the “pecking order” here in the Spanish archipelago. Being a foreigner on the island, she has to go by the rules and leave the best waves to the locals. She perfectly knows the unwritten code, so she silently sits well away from the pack. On the horizon, she suddenly spots a set of larger waves, and paddles towards them for safety. She can only sit on the shoulder of every perfectly breaking wave as the locals mercifully catch what they deserve according to the established hierarchy. Unexpectedly, there are more waves in the set than there are local surfers, and the last one will clearly go unridden. Alena moves easily into position and stands up on her board with agility and perfect timing, finally getting that first rush of adrenaline of the day. The bottom of the wave hits the reef and slows down, throwing a lip of water over her head. A beautiful tube of water swallows Alena, where the sun creates an indescribable kaleidoscope of light and beauty. This is the moment that pays back for all the waiting and all the hassling. The ride is as satisfying as it is short, as another surfer suddenly takes off right in front of Alena, violating the most basic rule of priority. To avoid a dangerous impact, Alena has to aim for the beach where she gets tossed by the force of the breaking wave against the reef. Fortunately her wetsuit protects her from the shock and she suffers no harm. However, her surfboard is badly damaged. She barely has time to figure out what happened that the man starts yelling and orders her to get out of the water. Later on the car park the surreal scene resumes. The man comes out of the water after Alena, threatening and ordering her to leave the island right away. “My friends and I were in shock. We really thought he was going to hit me,” she told me. According to her acquaintances, this wasn’t the man’s first altercation. He is strongly suspected for setting a tourist’s car on fire. An example for whoever inadvertently wishes to surf a “local only” break. Alena would have preferred to avoid this man and “the worst surfing experience of her life”. Surfers aren’t all laidback beach hippies touring the world for the postcard perfect surf spots, as the cliché would suggest. In truth, the most popular surf breaks around the world have reached saturation point, where countless stories of surf rage occurred. Every continent has its example: Snapper Rocks in Australia, Trestles in California, Uluwatu in Indonesia or even Mundaka in Spain. The shark isn’t the surfer’s worst nightmare. Sartre once said “Hell is other people…” which perfectly applies to the current state of the surfing world. To find the root of the problem, we need to look back at the 1960s. Backed up by Hollywood blockbusters, the surfer figure became very popular amongst young Americans. The prospect of eternal youth, a perfect tan and countless girlfriends were enough to create a mass migration towards the beach, in particular towards the ultimate place to be: Malibu in California. Today, there are 23 million people worldwide that claim a part of the dream that was sold to them. 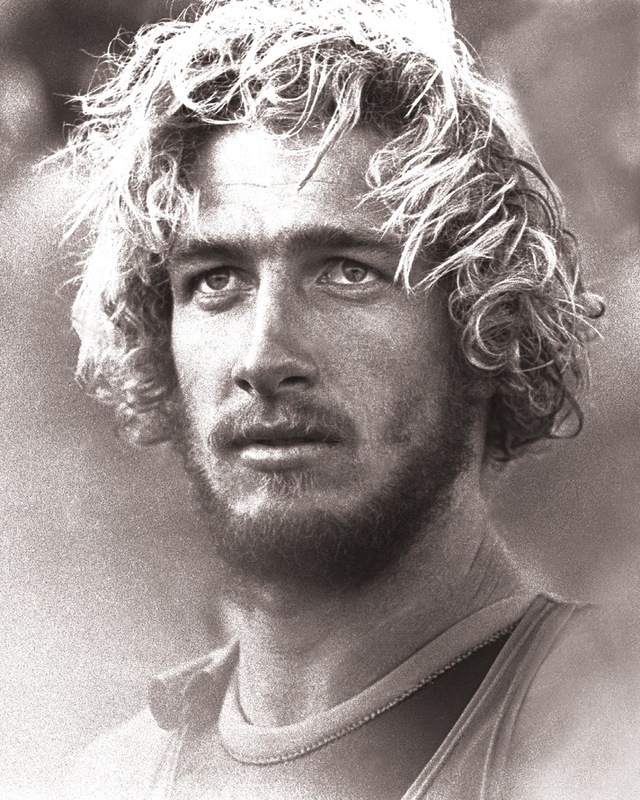 “People like Quicksilver saw an opening and decided that everybody should be a surfer, explains the Australian legend Nat Young, quadruple world champion, his first title in 1966. So they marketed surfing as a promotional tool to sell their clothing. It has created a situation where there’s still the same number of waves as in the 1960s, but there are now millions more surfers. The equation doesn’t work anymore”. Nat Young, who currently lives in California, has witnessed the evolution of his sport first-hand. In March 2000 at Angourie point, on the East coast of Australia, a teenager lashed back at Nat for what was apparently a priority issue. The argument got to the point where Nat slapped the young surfer. Back at the beach, the teenager’s father lost it and beat up Nat’s face to a pulp. The multiple fractures took ages to heal at the hospital. During that time, Nat thought about what happened and decided to write the book “Surf Rage”, a surfer’s guide to turn negatives into positives. In the past, surfing pioneers were driven by the dream of unridden surf breaks in exotic locations, with hopes of escaping the ever growing crowds. Miki Dora, a Californian surf legend, decided to leave Malibu at the end of the 1960s, because it was already too crowded and marketed for him. He found peace and quiet in the Basque Country, which happens to produce one of the best waves in Europe. However, a quality wave doesn’t stay unridden for long. Much like profitable mines during a Gold Rush, a good surf spot will gain a reputation with those who can’t hold their tongue. Stories and photographs are shared around a beer, Surf Magazines publish articles and suddenly punches are being thrown over a priority rule at a surf break that didn’t have a name a few years ago. A further aggravating factor came in the early 2000s. Weather predictions with swell size, period and direction became insanely precise. Surfers are now able to forecast in real time which surf break has the potential to produce the best waves for every swell. Gone are the times where a drive down to the beach was necessary to know what the ocean would deliver. The entire world is now watching live streaming of your beach’s webcam. The ever growing crowds of surfers triggered the first “surfrider’s code of ethics” which was erected on a famous beach of South Western Australia in 1986. A sign already encouraging the return of respect amongst surfers. “Many other signs have followed the original one, says Nat Young. There are now signs on every continent, and we financed the first one in Byron Bay in Australia, and the first one in France. We also paid for the one in Japan. Today, the towns themselves finance the beach signs because their effectiveness is proven”. In theory, a crowd of surfers could very well coexist at any break if these simple rules were followed. However, several factors prevent the theory to apply in real life. First of all, many beginners don’t respect the code because no one has taken the time to explain it to them. “I believe it is crucial to get lessons from a professional or from a friend, explains Alena. In my case, I learned the code the hard way. One day, another surfer pointed out my ignorance. 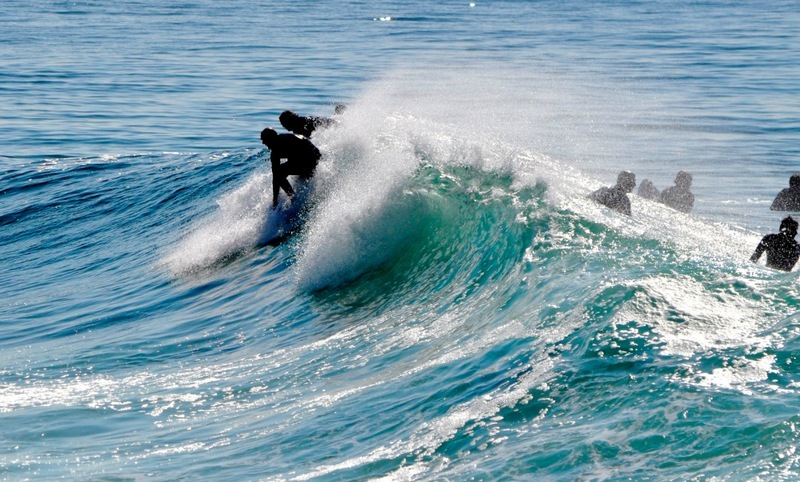 I was catching wave after wave under his nose, without waiting my turn. He was pissed off at me but after I asked him, he took the time to explain my mistakes. Now, when I encounter a surfer that’s obviously clueless, I sometimes remind him what the rules are. Usually, it works, but it’s a pain to have to educate the others”. Ignorant beginners are often at the root of a tensed situation in the water. But in the case of the Spanish surfer who violated Alena’s priority in The Canaries, the “surfrider’s code of ethic” wasn’t breached. Instead Alena broke a rule of the unwritten code of “localism”, the dark side of the surfing world. People who live next to a wave and surf it all year round believe they can bend the universal rules to their personal satisfaction. A notion not always perfectly understood, hence the “uneasy” situations. This “localism” concept in the surfing world is far from new, and it can be traced back to the birth-place of surfing: The islands of Hawaii, prior to Captain Cook’s very first contact. A Hawaiian legend tells the story of a young man who nearly got executed after riding the same wave as a chiefstess, a female member of the higher cast of society. Hawaii has a long history of surf-related violence and heavy localism. On the North Shore of Oahu, the unwritten code is part of the coastline’s DNA. It is not a coincidence if it is also the home of one of the most dangerous, and thus interesting wave of the world: Banzaï Pipeline. In the winter season, surfers from all around the world gather on this stretch of coast to compare skills in the most intense hollow wave the ocean is capable of producing. With such a crowd fuelled by adrenaline and testosterone, the situation in the water can hardly get any tenser. “Hawaii has always been the frontline of surfing in the world, says Nat Young. I was there in the 1960s and had a wonderful time. I always tried to give respect, and I always received a lot of it in return. But the Hawaiians have very little patience for fools. I understand that, but I also know that I now have no desire to go surfing in Hawaii”. The spirit of Aloha started to change in the 1970s, when obvious lack of respect from visitors was embarrassing the “sport of kings”. Something had to be done about these packs of “haoles”, the pejorative term in Hawaii for the white people. Groups of colonialist-like Australians and Americans came believing they could get away with anything, and Hawaiians decided to fight back. The absence of respect and safety on the beach and in the water gave birth to several gangs who quickly became notorious for wreaking havoc on the islands. Beware of the Black Shorts, the Da Hui and the Wolfpak who took upon themselves to restore some semblance of order. Kala Alexander a legendary Hawaiian surfer and founding member of the Wolfpak, explains the purpose of his group: “It’s not in a lifeguard’s job description to remove people from the water if they’re not skilled enough to be out there. So we did it. We would tell people to go back on the beach if we thought they were going to hurt somebody. The problem is that it’s not that hard to paddle out at Pipeline. So the uneducated walk out and the water’s blue, it’s sunny, there are chicks on the beach. But more people have died in the water there than at any other wave. It breaks with a 20-foot face in four feet of water, with a reef right below. The wave moves really quickly, and if you get bounced off that reef, you’re in trouble. Flesh gets ripped off. Limbs get broken. It’s a really unforgiving place. We were trying to make it safer. I don’t know how many fights I’ve been in, but Pipeline was just out of control”. According to Alena, order and respect are both necessary to surf in good conditions: “It’s probably in Hawaii that it’s the most obvious. Nobody will try to steal your wave there, I’ve never seen anything like it. On the other hand, beware if you miss it, you’d better get out of the water because the next one will be caught by someone else”. These drastic rules are necessary to bring security into the sport: only the most experienced surfers should have a go at these potentially lethal waves. “The level is incredibly high in Hawaii, we feel safe knowing that nobody will let go of their board in these dangerous conditions”, adds the Swiss surfer girl. But the North Shore is an exception in the surfing world. Elsewhere, utter chaos isn’t hard to find. Year after year, the most despicable behaviour in the surf is awarded to Brazilians. 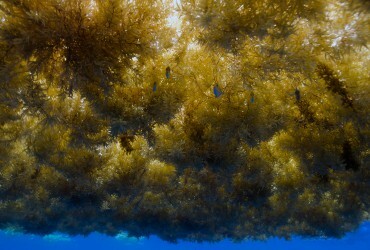 Their notorious reputation comes from the fact that they generally travel and surf in groups. Nat Young has also witnessed tense situations lately: “I was in Bali last month, and Russian surfers were the most aggressive. Normally, Brazilians have that leading role. But they’re also the ones that don’t have a clue. They ignore the etiquette of the sport. But it’s not their fault you know! Brazilians and Russians are very new to surfing and they don’t understand what the unwritten rules are”. As opposed to Swiss, Brazilian or Russian surfers who need to travel to find good waves, local surfers enjoy the same spot all year long. Without necessarily seeing the emergence of gangs of violent surfers, “localism” strengthens. The really violent situations happen when a group of locals try to desperately keep a secret spot out of the spotlight. 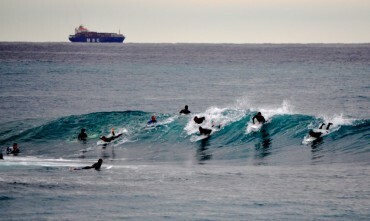 Foreign surfers accompanied by photographers are seen as a direct threat. The worst case scenario would be the spreading of their well-guarded secret all over the internet, creating massive arrivals of surfing “kooks”, fools who can’t appreciate the wave as much as the locals. Nowadays, a “No Facebook please!” is a friendly reminder to keep it quiet, or else. “For me, surf rage is not a long way away from road rage, says Nat Young. 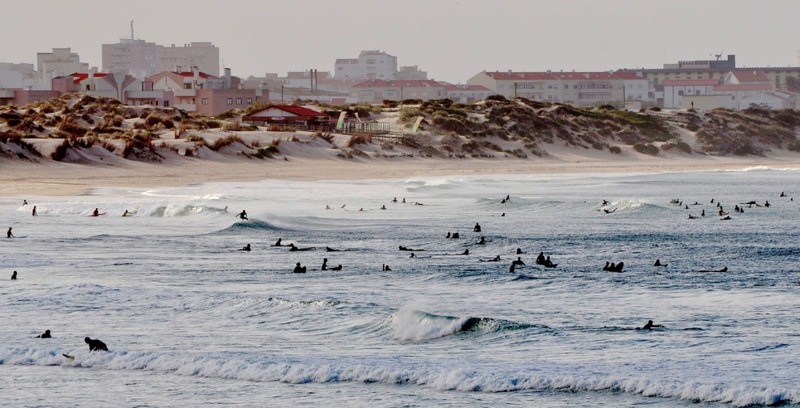 A crowded surf spot looks very much like a crowded highway. If you want to be a surfer in 2014, you have to be tolerant. If you can’t be, then you are going to be very unhappy. You are also going to be pissed off, and that defeats the whole purpose of going in the water and having fun”. Instead of feeling nostalgic for “the good old days”, surfers could instead target their frustrations towards more constructive battles. There is a trend in associations and groups of surfers who fight for common causes. Industrial and private coastal development, rising sea levels or the extinction of sea predators that eat jellyfish are all serious enemies to the future of a safe and healthy surfing world. Crowds aren’t going away anytime soon, and tolerance is the key to accept it. “I can tell you honestly that I’d rather see more people surfing than less, Nat Young concludes. I genuinely believe that surfers are better people in general. We really have an activity of the future, because nature is involved. The more people surf, the better it’s going to be for the planet. It’s exactly what the world needs”.